Fig 1: Official and alternative scenarios for U.S. GDP growthWhat we find most intriguing, but equally most worrying, is that in all the economic projections we have seen lately, decline or zero growth aren't even mentioned as a faint possibility. We can only speculate why that is the case, but we see significant evidence that only limited effort - if any - is put into understanding the possible consequences and required mitigation strategies. We are highly alarmed about the fact that so few people seem to be ready to think the not-so-unthinkable. Given the constraints in natural resources, our currently unprecedented levels of debt on a global scale, and the absence of ideas for that next grand "leap forward" for mankind, it seems plausible to us that we might have to say goodbye to economic Fig 2. We have no insurance for no-growth scenariosgrowth, and not just for a year or two, but for long, maybe forever. IIER's models say that chances for steady economic growth after 2010 are below 10-20%, but even if you disagree with that low a number and put the probability for "more growth" to, say, 80%, we consider it quite irresponsible to not at least consider the other 20%. 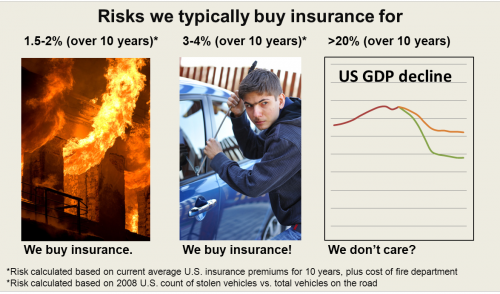 Not buying insurance for a risk that might hit you with a one in five chance seems quite foolish to us. Our current world is about as prepared for "no growth" as is a fish to walk on land. All our current claims systems, the credit outstanding, including government debt, our pension expectations, our savings, our hopes and dreams, are mostly focused on "more tomorrow". Should this "more" disappear as a possibility, we will likely not just see small implications, but rather a disruptive destruction of perceived wealth and security, accompanied by the shattering of hopes and dreams, which might cause further trouble in our highly complex societies. But the worst will happen if we run into such a world completely unprepared. This is why we urgently need policymakers to face the risk of "no-growth", to understand possible implications and to work on mitigation approaches. Why not use upcoming elections to ask a few questions? This is why we have - after some animated discussions - drafted a letter to an imaginary politician who wants to get elected in 2010 or 2011. We see no reason why this kind of letter shouldn't be sent to real people who want our vote. If you agree, please feel free to use the template below for your own questions to whomever wants your help in getting (re)elected. Dear candidate - have you ever... ? You are currently running for office as _____________________ in ____________________. As you know, we are living through economically tough times, and I hear a lot about how the economy can be brought back to stability and prosperity. However, have you ever considered that economic growth might actually not return? That we might have to settle for less? If so, what would be your plans to mitigate such a situation, to make sure that life can go on for your constituents in a future where "more each year" is no longer possible? Or alternatively, if you don't have any plans - are you 100 percent certain that growth and prosperity will ever return, and if so, why is it that you see no risk worth looking at? I would truly appreciate an honest answer to my question, as I am personally very worried about the risk of "no more growth" in the foreseeable future, but even more concerned about the absence of us making any plans for such a possibility. by Robin Datta on Sat, Jul 10, 2010 - 21:15 (EST). Inquisitions can take many forms, and heresies such as this will certainly invite their quota - particularly when threatening the accepted modes of thought. When the force of events finally breaks the mold, the acceptance of the new paradigms may come too late to implement policies to significantly alleviate the massive sufferings. by Dwayne Chesnut on Tue, Jun 29, 2010 - 11:50 (EST). I stumbled onto your site while following the catastrophic blowout in the Gulf of Mexico on The Oil Drum, where I found your article on the Fake Fire Brigade. I have been worried about many of the issues you raise since the 1970s, as a scientist and engineer (B.S. Chemical Engineering, Ph.D. in theoretical physical chemistry, both from Rice University). I retired in 2000, after a career in the upstream oil and gas industry and nuclear waste disposal. If you are interested in more detail, please take a look at a website developed for my recent unsuccessful campaign for State University Regent in Nevada: http://www.dwaynechesnut.com. It has a detailed summary of my professional career. I have a good friend, an economist, with whom I've had a disagreement for more than 30 years on the sustainability of economic growth. His position is that human ingenuity has unlimited potential to find substitutes for any scarce resource. Mine is that energy is the ultimate constraint and that we will eventually reach the point of a negative return on energy investment. I remember some vigorous discussions on Limits to Growth when the book was first published. I am not well-versed in the literature of economics, but have been wondering if any effort has been devoted to developing even the concept of a steady-state economy. It seems to me that all the attention has been on two alternatives: growth or decay. I am very glad to see you at least raise the question, and look forward to reading more as your ideas develop.